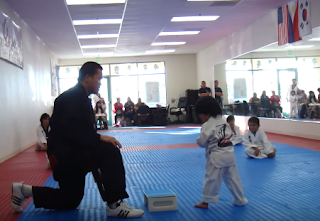 A video of a little boy making several cute attempts to break a board using his foot in order to earn his first Taekwondo belt has captured the hearts of many netizens around the world. In the video, the tiny Taekwondo jin tries every possible way he can think of to break the board even as his classmates giggle. Rohan, the name of the boy, perseveres and eventually breaks the board while screaming "Aya! ", earning himself a white belt. The clip was posted on the Facebook page of the Filipino-owned Peak Taekwondo and Fitness Center in California last Thursday which later became viral in the popular social networking site and then picked up by numerous websites and TV networks. The video has amassed 8.2 million views as of this posting. The administrator of the Facebook page told us that the video was taken in 2011 when the school was opened. Rohan, who is Filipino-American, is now 7 years old, he added.